Whenever you think about organizing your garage, you probably begin to develop some anxiety and never want to think about it again. Luckily, we have some great tips and tricks for you to make that task just a little easier! These amazing new tips will not only give you a peace of mind when thinking about your garage, but will also give your garage the makeover it has been desperately asking for. The best thing to do after you have cleaned your garage and organized everything into separate piles is to create separate zones. Whenever you walk into a store and want to buy milk, you walk straight to the dairy section to find it. It would be so frustrating if grocery stores put their milk section in the middle of an isle next to the pretzels and chips. The same goes for your garage. 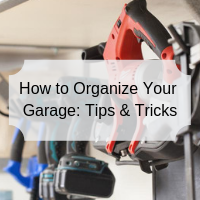 There are hundreds of different types of garage organizers out there. The key to finding one that will last for years is the hard part. You do not want to buy cheap organizers because they will only last you for a few years at the most. The best route to take is to find something that can withstand a lot of weight and that will not warp or crack when exposed to heat and cold weather. After you have completed all of these steps, your only job will be making sure that everything stays organized. It can be very difficult to keep everything looking organized and clean, but it is not impossible. Good luck!